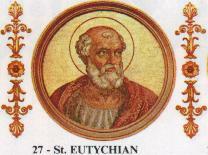 Pope Saint Eutychian, also known as Eutychianus, was the bishop of Rome in the last quarter of the third century. Little is known about him that can be considered historical. Catholic sources cite his reign as beginning on January 4, 275 and ending on December 7, 283. During Eutychian's time, the Catholic Church continued its development as an increasingly important institution within the Roman Empire. Tradition holds that Eutychian was particularly attentive to the graves of the martyrs. However, since he lived during a period of peace between the Roman state and the Christian church, his supposed martyrdom is not considered historical, even in contemporary Catholic tradition. Eutychian was buried, like many other early popes, in the Catacomb of Callixtus, and his feast day is commemorated on December 8. Unlike some of his predecessors in the mid-third century, sources for Eutychian's life are very scarce. His is said to have been born in the town of Luni in the region of Tuscany, and his father's name is given as Marinus. Liber Pontificalis gives him a reign of eight years and 11 months, from 275 to 283. The Church History of Eusebius of Caesarea, written considerably earlier, however, says that he was Rome's bishop for only ten months. His reign is given in modern Catholic sources as lasting from January 4, 275 to December 7, 283. Eutychian is also said to have authorized the blessing of grapes and beans on the altar during the mass. This report, too, is looked upon with skepticism today, since the blessing of the produce of the fields is believed to belong to a later period. During Eutychian's time, internal disputes still plagued the church, including the continuing Novatianist controversy and various trinitarian and christological debates. The Novatianist schism had been initiated during the reign of Pope Cornelius when the Roman presbyter Novatian was elected as a rival bishop of Rome, becoming the second antipope. The issue concerned the question of whether "lapsed" Christians—those who committed apostasy during the persecution but now wished to return to the church—could be granted absolution and readmitted to communion. The Novatianist movement had spread throughout the Roman Empire and remained a potent force during Eutychian's time. Trinitarian controversies also had begun to emerge during this period, arguing over such questions as whether the Trinity functioned as three "modes" of God's being or three distinct "persons" within the Godhead. The sources leave no record, however, of Eutychian's role in either the Novatianist or trinitarian debates. The Liber Pontificalis reports that Eutychian buried 324 martyrs with his own hands. Most historians doubt this tradition, however, as there are no credible reports of major persecutions during the time in question. Somewhat more plausible is the idea that he ordained certain ceremonial procedures for the burial of martyrs, for there is indeed evidence that the martyrs had begun to be venerated with considerable honor in the catacombs on Rome's outskirts in these times. Contrary to popular belief, most historians today hold that early Christians did not hide in the catacombs to avoid persecution. Rather, they went there to gather in prayer, celebrate funeral rites, and mark the anniversaries of the martyrs. Moreover, whether his reign was ten months or eight years, Euchtychian lived during a time remarkable for the peace which the Christian church enjoyed in its relations with the Roman state. Given the lack of persecution in his time, it is likely that Eutychian did not die a martyr. The Liber Pontificalis claims this title for him, saying that "he was crowned with martyrdom," as it does for nearly all the early popes. However, an earlier fourth-century Roman calendar mentions him only as a Roman bishop, not in its list of martyrs. In later tradition, it was assumed that the early Christian church endured several centuries of consistent and widespread persecution. The Christians were indeed often suspected of disloyalty due in part to their lack of support of Rome's earthly kingdom in favor of the kingdom of Chirst, which was "not of this world." Thus, the writers of later papal histories, often ignorant of the details of particular imperial reigns and not knowing for certain when a given pope actual reigned, apparently presumed that each of the popes was a martyr his natural death was attested in a source known to them. Like many of these supposed martyred popes, Eutychian today is thought to have died a natural death. His remains were placed in the papal chapel in the Catacomb of Callixtus. When this famous crypt was rediscovered in 1849, fragments of his epitaph were found with his name in Greek letters. His feast is kept on December 8. The papacy during Eutychian's time furthered the development of the Roman Christian church into a major cultural institution that would emerge in the fourth century as the official religion of the Roman Empire. This page was last modified on 10 October 2013, at 15:11.